For exporting the reversal entries you only need the fields “Headword” and “Definition (or Gloss)”. Please don’t include other fields like example sentences and semantic domains as this will make the file much bigger and the import therefore more likely to timeout. 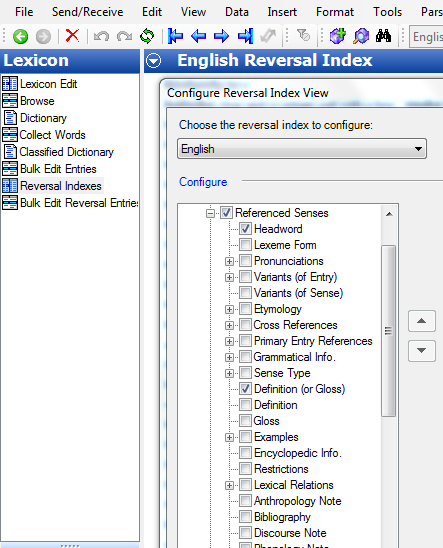 In FLEx, go to “Reversal Indexes” in the Lexicon View and then in the top menu click on Tools – Configure – Reversal Index… Then under “Referenced Senses” uncheck all the fields you don’t need. The reversal browse view basically creates a link to the main entry which got exported with the configured view. Therefore the css file is not needed.